I'm quite surprised of how fast I learned the pattern, and how little it bores me. Not at all, in fact. I'm not a wonder of persistance, so this is already a rewarding experience, and I find great pleasure in the thought of actually be able to wear this masterpiece this fall. This week Fi MSN'ed me in panic from her new summer house, explaining that she was out of yarn. As a knitter I know a crisis when I see one, so I immediately rushed to her rescue by buying her four balls of Fabel and a couple of circulars (she knits socks on two circulars, crazy woman). As payment I asked her to order me two surprise hanks of Lorna's Laces Shepherd Sock, now available in Sweden through Garnkorgen. And she did! She got me Periwinkle, a lilac I've been admiring for a long time. (Good knitting friends can pick good colours for each other.) After fifteen minutes of struggling with some fancy schmancy toe cast on I went for the figure 8 cast on and am now a few rows away from beginning the pattern of the Wishbone socks. So cute! I would also like to thank Theresia for her excellent guidance in sock leg length. For a size 39, 20 cm's shouldn't be a problem. I will use this information the next time I knit socks top-down, but my current sock is knit in way too fancy yarn for not knitting toe-up and making certain I knit to the last centimetre of it..
Gee, I'm blogging like never before. I'm not a very experienced sock knitter, and especially not when it comes to whipping up socks like my summer socks, without pattern (albeit with a little help from the Yarn Harlots sock recipe). To ensure that I do not run out of yarn or patience I knit my legs until they are 15 cm long. Now it seems I have half of the pretty green yarn left, and it was a regular 100 grams of regular sock yarn. I guess I could have made them slightly longer. So my question to my sock-knitting blog readers (Theresia, I'm looking at you) is: How long a sock leg can you knit with 100 grams of sock yarn? I do understand that it varies and depends, but I have size 39 feet (7 in US sizing) so they are neither huge nor petit. I like to think they are average (but I know they're not). Tell me! Whats your favorite summer time drink? I'd have to say iced tea (the kind you make yourself and not the Nestea sugary crap). I make green tea (and always plan ahead so it has time to cool off ;-) to which I add freshly squeezed lemon and some sugar. And icecubes. Best enjoyed in a high glass with a colourful figure-shaped straw. My desire to knit have been quite low recently, but a few weeks ago I felt like knitting something quick and simple (as always), and with the Swedish summer being here in all its glory (although I must say it's been exceptionally fine this far) I figured I needed a pair of summer socks, for those chilly evenings in the garden. 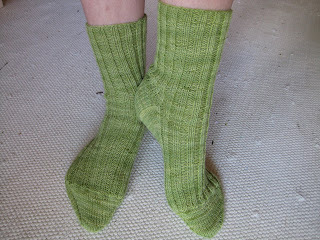 I went to Nysta and fell in love with a hank of Araucania Ranco Solid in the prettiest green imaginable, and now I have socks. 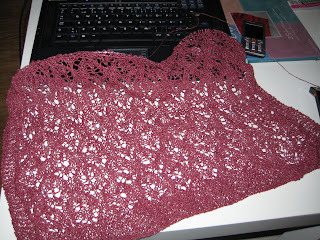 Tonight I've cast on for a stole/scarf thing, but I wouldn't hope too much on it, because I don't feel very inspired... But Secret Pal 12 has kicked off and I'm very excited about that. I've been contacted by my spoiler, and she seems super nice, and I've said hi to my spoilee and she seems really nice too, so I'm going to have an awesome summer, stole or not. A few days ago I received a package of quilt fabrics that I had ordered from Purl, and tonight I've washed half of them and started figuring out what to do with all the printed cotton adorableness I've got stashed. I think I'm going for a big, cozy and cute (pastels only...) quilt. I'll post some pictures when I've got it more sorted out.